The restaurant industry can be an extremely tough business to be in, according to Intuit restaurants have a 20% success rate! 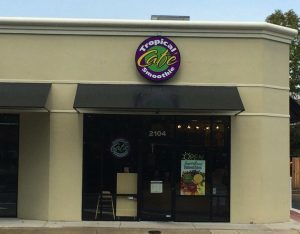 The industry is competitive on all levels: small restaurants have to make a name for themselves against larger restaurant chains; franchise owners are part of a larger brand but still have to stand out; and everyone is dealing with customer reviews on Yelp, online marketing, and in general, trying to get more traffic through the door. While the task of increasing foot traffic to your restaurant can be daunting, having a sign is one of the main ways to attract customers to your establishment. Able to display anything from the logo, promotional offerings, pictures of food, store hours and more. To conclude, if you want a sign that will save you money and storage space then an A-Frame sign is the solution. An A-Frame sign can be placed outside of your establishment or along the sidewalk where there is a ton of foot traffic. Window signs are good for promoting your business from a distance while enhancing the style of the restaurant’s exterior. Lastly, Wall Murals can be a way to fill up blank space in your restaurant with art, a logo, or any graphics that can set the ambience of the room. Any of these signage options can help your business get attention, increase foot traffic and cater to your target audience. Looking for signage for your restaurant?